Probably one of the oldest cities alive in the history of our country, Varanasi holds a very eminent part in holding all the ritual values and cultures of India. It was previously known as “Kashi”, “Benaras” or “Banaras”. It is a city situated on the banks of the Ganges in the Uttar Pradesh state of North India. One of the major religious hubs in India, it is the holiest of the seven sacred cities (Sapta Puri) in Hinduism and Jainism and plays an important role in the development of Buddhism. Varanasi lies along National Highway 2, which connects it to Kolkata, Varanasi, Agra, and Delhi, and is served by Varanasi Junction railway station and Lal Bahadur Shastri International Airport. Apart from being considered rich in its cultural values, it is so very famous for its “Banarasi paan”. One must never miss tasting this super famous thing around the world. Nothing in the world can beat the street foods of Varanasi. The food of Benaras or Varanasi is influenced by its people. You will find Marwari traders and people from nearby states including Bihar and West Bengal in the city have added their own regional touch to the local cuisine. The vegetarian delicacies are majorly prepared in desi ghee and mustard oil, be it spicy, sweet or sour. Most Varanasi sweets have a milk and ghee base like the Magdal, Sankat Mochan ka Laddoo, Parval Mithai, Kheer Mohan and Langlade among others.” Here are some popular street snacks from Varanasi or Benaras that you must try if you ever visit the city. Kachori sabji makes for the most popular Kaleva (breakfast) option in Benaras. There are two different types of kachoris- badi and choti kachori. Badi kachori is stuffed with masala made of lentils called dal ki pithi and choti kachori is stuffed with a spicy potato mixture. Both of these kachoris are savored with garam masala wali aloo ki sabzi and desi ghee jalebi. What a way to start your day! Chena is similar to Rasmalai in terms of shape and is dipped in sweet yogurt and a hint of masala made of jeera and black salt. It makes for a perfect mix of sweet and sour. The coriander garnishing makes it more refreshing. Makhan, Malaiyyo or Nimish is a popular winter street dessert that is influenced by Persian way of cooking. Milk froth is flavored with saffron and cardamoms and garnished with pistachios and almonds. Served in Purva or kulhads, this creamy froth will literally melt in your mouth. Varanasi is a city that produces lots of milk and curd and therefore, you’ll find them in most of their preparations. Benarasi Thandai is made from seasonal fruit puree. Along with that, lassi is available at almost every other street shop from morning till wee hours of the night. It is served in a kulhad topped with Rabri and flavored with rose essence. 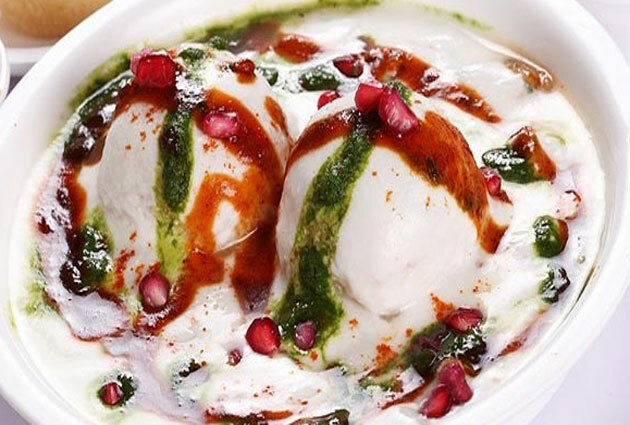 After such yummy list, there is no doubt that food is a significant part of Varanasi’s culture—especially its piping hot kachoris at breakfast, refreshing paans, sweets, lassi, and thandai. Most of the local favorite restaurants in Varanasi lie near the ghats or in the jumble of narrow lanes that run behind them. These mouthwatering street snacks will create everlasting food memories and you must try them. Let us know if we’ve missed any.